With the new territory comes a new challenge – the post class recovery. And I’m not talking about my muscles – but my entire being. Ideally – I’ll have a spare set of clothes and I can grab a shower before I head out but that’s not always an option. So with a new part of my fitness journey comes a new bag packed with some sweaty essentials. I’ve tested and tried many – and these are my winners. 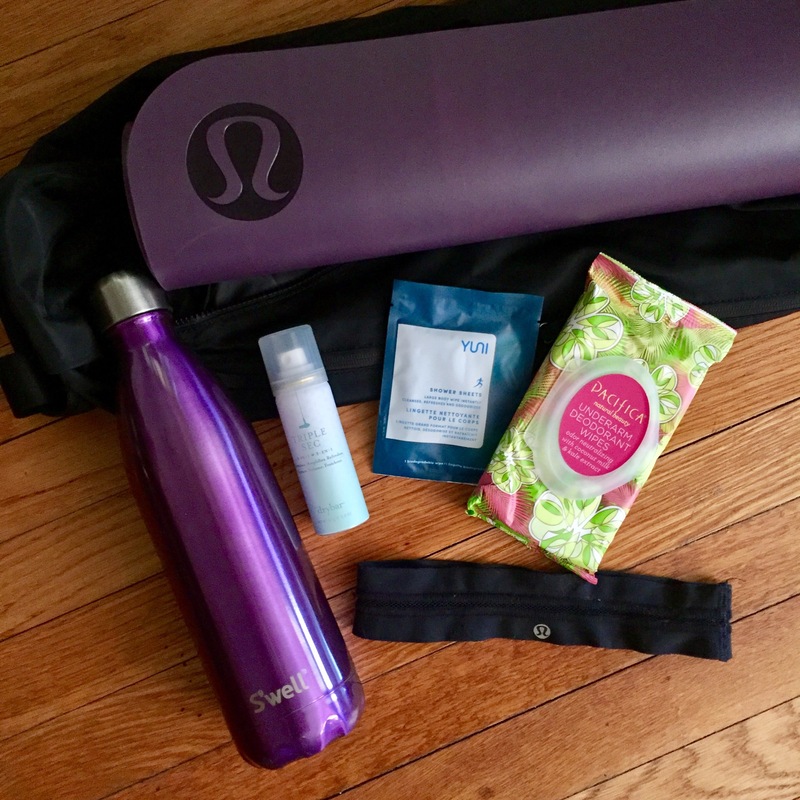 lululemon 3mm Yoga Mat: At first, I rented a mat from the studio. Then, I began to be distracted by thinking about how many sweaty bodies has been on that mat – I mean it is hot yoga! I then purchased a mat but it was too heavy for commuting so I turned to my friends at lulu and they knew just what I needed. The 3mm is light enough to travel, thick enough I don’t feel the hard wood below, grippy enough I don’t slide, and as a bonus – it’s my favorite color. If you aren’t traveling the 5mm is probably a better option but for commuters like me – grab the 3mm. lululemon Yoga Bag: With every mat comes a means of transporting it. Since I take the LIRR and the subways I knew I wanted a bag versus a strap. This bag is perfect because it fits on my back with my tote bag, has several pockets (including separate ones for essentials and one for your sweaty post yoga clothes), and is holding up with the heavy commute. Yuni Shower Sheets: These babies have been life changing. I first started using these on my lunch time runs and they were perfect for a quick clean up before heading back to work. The large size is perfect so you truly can wipe own your whole body and they come individually packaged! The one down side is the scent is not my favorite – but it doesn’t linger around so I quickly got over it. Best part is you can get them from Sephora! Pacifica Underarm Deodorant Wipes: One of my favorite Target finds – these gems are great for before or after class when you need to freshen up your underarms! These come in a resealable pouch and I keep a pack in my bag and at my desk at work! Dry Bar Triple Sec/Detox: As you guys know – this product is my life. If I’m just going home – I tie my hair up into a top knot. If I need to go anywhere else you NEED this dry shampoo (detox is their dry shampoo- triple sec is there 3 in 1 spray that’s also amazing). I keep a full sized bottle at home and at my desk and a travel size in my gym bags. S’well Bottle: Reusable water bottles had a great year in 2016 and I think Swell was the fan favorite. It’s a great size to keep you hydrated and the insulation keeps your water cold even if the temperature in the room climbs. And you feel like you are saving the environment too! lululemon wide headband: One of my biggest annoyances is when I have hair falling into my mouth while I’m trying to get my downward dog on but I also didn’t want a headband that would leave any creases. This headband is several years but sometimes a class is all you need. What essentials do you pack in your gym bag? Do you have any favorites?